Today, at Abundance 360, an exclusive event for tech entrepreneurs in Beverly Hills, California, Boston Dynamics unveiled a video of "Handle," a humanoid-like robot with wheels instead of feet. Abundance 360 is founded by Silicon Valley tech veteran Peter Diamandis and describes itself as an "exclusive group of entrepreneurs passionate about generating extraordinary wealth while creating a world of abundance." The video was taken by Steve Jurvetson, a wealthy venture capitalist who some describe as "the smartest person in Silicon Valley." 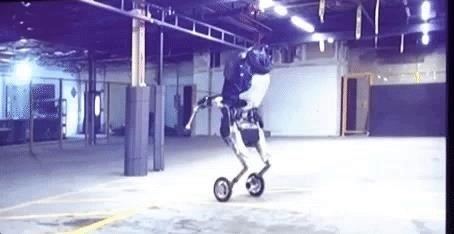 The presentation in the video is by Boston Dynamics founder Marc Raibert, a former professor at Carnegie Mellon and MIT. 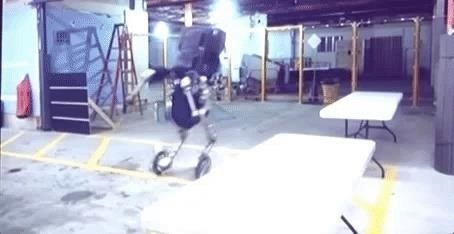 Boston Dynamics was one of several top robotics companies bought by Google at the end of 2013, although in 2016, there were persistent rumors that Alphabet (Google's new parent company) were committed to selling it to Toyota. However, from what we can tell, Boston Dynamics still resides within the Alphabet Group. Raibert, in his presentation, explained that everyone relates Boston Dynamics with legged robots, but this time they have developed a robot that is humanoid-like—with wheels instead of feet. This is the first time anyone else has seen this robot. This is the debut presentation of what I think will be a nightmare-inducing robot. 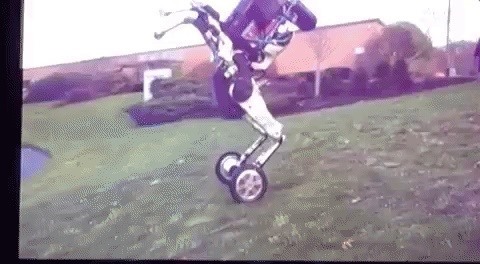 This robot is an experiment in combining wheels with legs, and is a dynamic system that keeps its balance all of the time, with a knowledge of how to throw its weight around to stabilize itself. 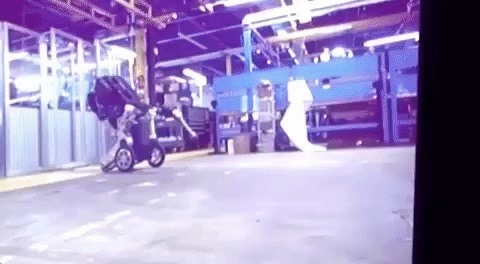 The robot demonstrated this very ably, by using its arms to balance when coming to a stop, and by using its arms to control the speed of a spin. Raibert explained that this design, although it loses some degrees of freedom with wheels, is much more efficient than a legged robot. The robot is also designed to be able to handle reasonably heavy loads with its arms, hence the name "Handle" given to it by its creators. 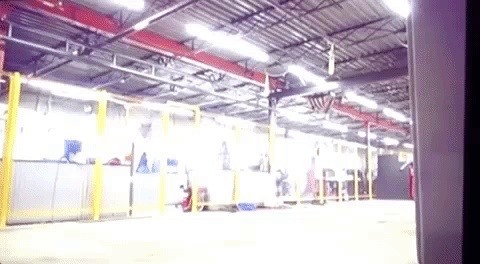 Its most impressive party trick was rolling at high speed, and then launching itself with a thrust of its wheeled legs over a low barricade obstructing its path. 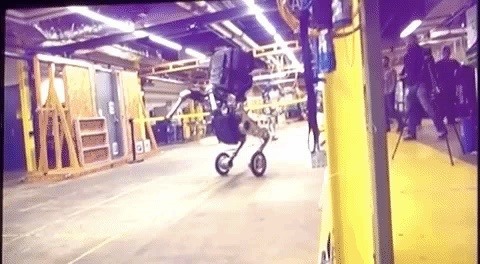 Check out the original video, stating at the 3:46 point where the new robot makes its entrance.